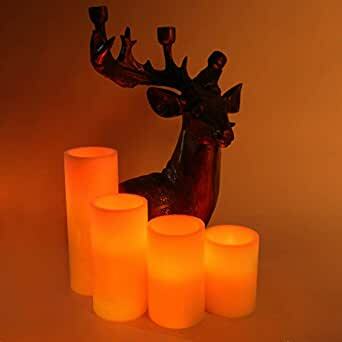 Perfect Decorating Flameless Candles: It can be widely applied to Christmas, Halloween, Thanksgiving and other festivals. – After using, you can press the remote “off” first, and then push button the candle bottom “off ” , It can help the electron save energy. -These flameless LED tea light candles are completely environmentally friendly. No Dripping Wax, No Smoke, No Risk of Fire. – Excellent decor items for wedding receptions, birthday parties, dinner parties, and other events. Perfect for Home, Restaurant, Bars, Hotel, Church decorations. – Safe for usage in any setting or occasion because these Flameless LED Candles doesn’t have an open flame and it doesn’t heat up during usage. – LED Candle is designed to flicker in a realistic way so that one can feel the ambience of an actual candle flame without any hazard or hassles. – Package include: 4 pcs.